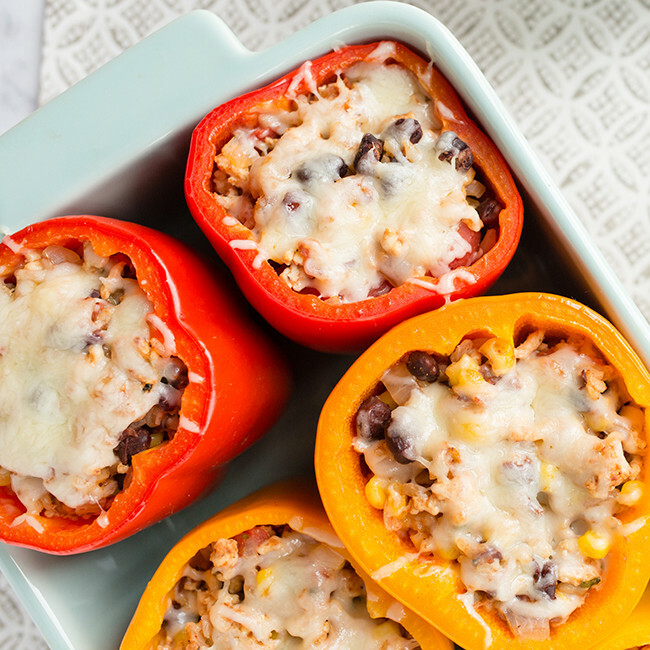 The ground turkey, tomato, corn, black bean and rice filling is so dense and delicious, you’d never know each pepper comes in at only 326 calories. Top them off with Monterey Jack cheese for a satisfying skinny supper your family will request time and time again! Dovetailing Tip: Buy 1 1/2 pounds of ground turkey. Cook 1/2 pound for this recipe. With the remaining 1 pound, put together the Mini Meatloaves for Meal 4. Cover and refrigerate. Your next meal is almost ready! Dovetailing Tip: When you cook the brown rice, always make a big batch. Remove 2 cups and store for Meal 5, Onion Rice. Freeze the remaining rice in serving meal size portions. Preheat the oven to 350° F. Set out a 9x13-inch baking dish and stand the peppers in the dish so they fit snugly, cut-side up. Heat a large skillet over medium heat and add the oil, onion, and jalapeño, cooking until the onions start to become translucent, 2-4 minutes. Add the turkey, breaking it up with a wooden spoon until it is all white, about 4-6 minutes, and season the meat with the cumin, chili powder, salt, and pepper. Add the black beans, corn, diced tomatoes, lime juice, cilantro, and cooked rice to the skillet. Stir to combine and remove from the heat. Evenly fill each pepper with about 3/4 cup of the skillet mixture. Pour enough water in the bottom of the baking dish to cover the bottoms of the peppers by about 1 centimeter. This will steam the peppers as they are in the oven to make them soft. Cover the dish with foil and bake until the the peppers are soft, 40-45 minutes. Uncover and top each pepper with 1 tablespoon of cheese and bake until the cheese is melted, 5 minutes. Serve each pepper with a dollop of optional light sour cream, or plain Greek yogurt and additional chopped cilantro and lime.